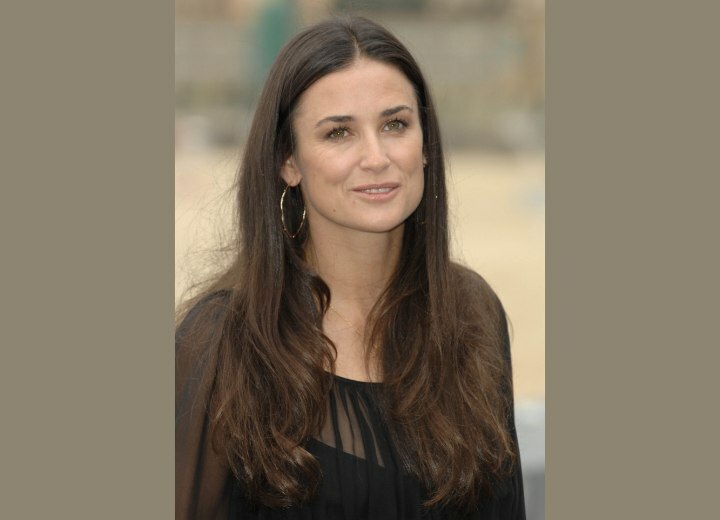 Demi Moore has very strong classic features with a square face shape and a thick long neck. She probably gets the muscular neck from her weight lifting. She keeps her hair long and most of the time parted in the center with angles along her sides, while the rest either falls straight or smooth or with a few idle curls (September 30th, 2007). Sometimes, you will find her with her hair pulled back into a ponytail when she is busy or up in an elegant upswing to go with her gown. Demi brings a lot of youth for women her age (over 40), but she has proven, you have to work at it all of the time. Watch what you eat and exercise. The photo reveals her with light make up and polished tweezed brows, light shadow, eyeliner, lashes, mascara, light blush and flesh colored lip tint. She has what is professionally called heterochromia, one green eye and one hazel eye. She just so happens to have the best of both worlds.